The timetable for today’s workshops is the same as the last 2 days which made knowing where to be and what to do much easier! During the morning session puppet making workshop, Miss Hannaford learnt a new way of attaching arm rods to the hands of the puppet. This method involving gluing the metal arm rod onto a piece of plastic called Sintra, then gluing the plastic between the 2 foam pieces of the hand. 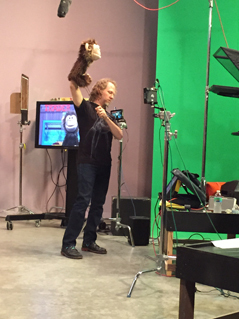 The rest of the workshop was devoted to sewing all the pieces of fur together to finish the skin of the monkey! 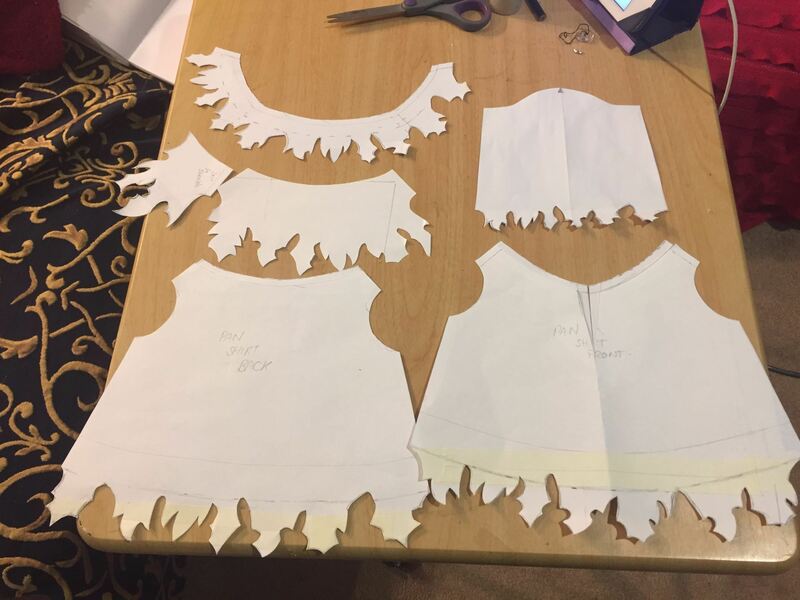 There are many pieces of fur so some of the students chose to send the sewing to the other room where there were volunteers with sewing machines but Miss Hannaford chose to bring the pieces back to the hotel and put them together by hand stitching for homework. After lunch with all the other students, it was time for the performance workshop! 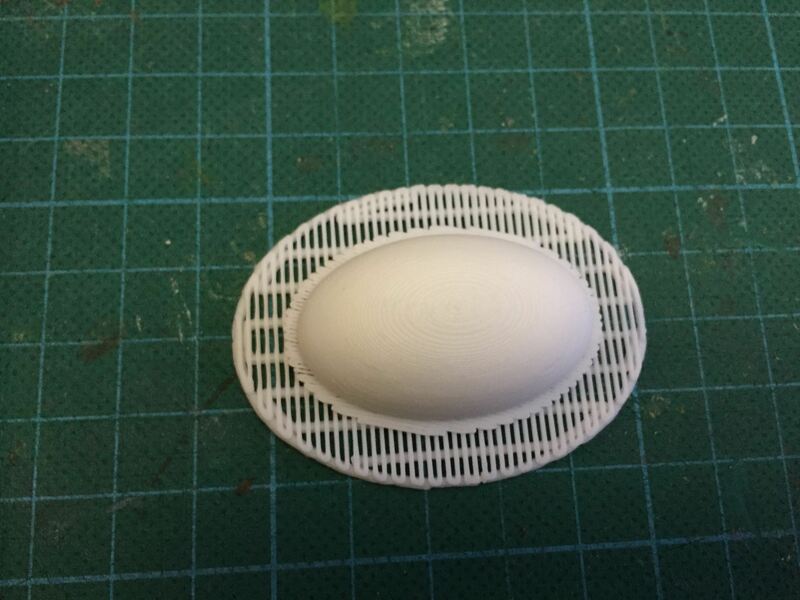 Today’s lesson focussed on using the Camera’s depth of field. This meant that the puppet started at the very back corner of the set and walked diagonally across the screen. 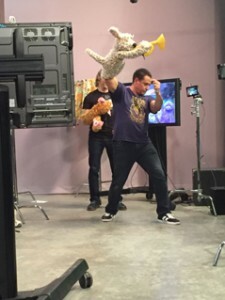 The trickiest part was that the puppeteer has to not only stop moving when the puppet is at the middle and make the puppet look at the camera and say hi before walking off the screen at the last possible moment but the further away from the camera the puppet is the more the puppeteer has to bend their body out of the camera shot! 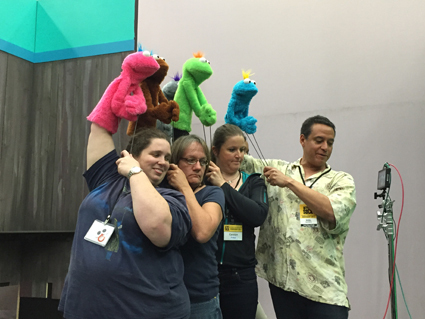 After a few more small group exercises in telling stories and making the puppets look at the puppet who is talking, it was time to start rehearsing the final show! Each student is asked to create their own short performance of less than 3 minutes as well as participate in a group song which has all the workshop attendees plus the instructors in it! The song chosen for 2015 was “We’ve got a dream” from the movie Tangled. 20 puppeteers and puppets had to squish into a very small space to learn to move together. The good part is that no one had to sing! 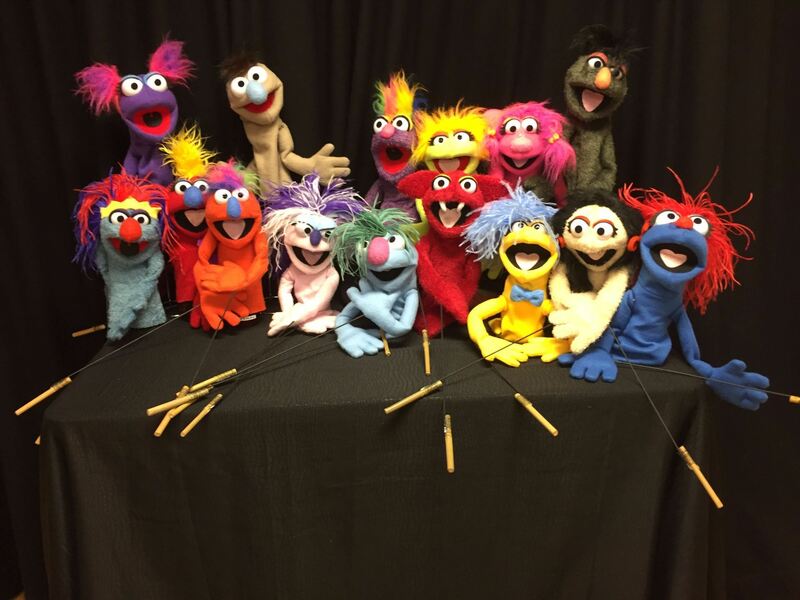 All the puppets were lipsyncing to the song! 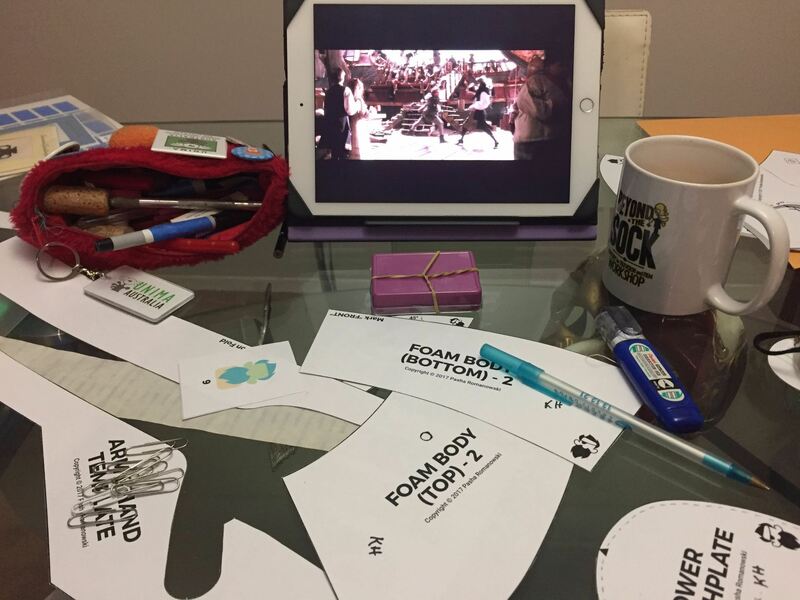 The homework from the performance class was to learn the puppet choreography and the words of the song! So once Miss Hannaford and the other attendees got back to the hotel, everyone had so much homework that they organised their own dinner and went back to their rooms to finish their homework. Today was the last day of Beyond the Sock 2015! Miss Hannaford finished all her homework but she was worried that she didn’t quite have the choreography of the song quite right. The timetable was the same as the last few days, so in the morning, Miss Hannaford nearly finished building her Monkey puppet by inserting the foam head into the skin and she nearly finished creating the eyes when she had to stop for lunch. No one was allowed to stay inside the workshop room on their own because of all the dangerous equipment around! After lunch was the performance workshop where the focus of today’s lesson was learning to read scripts taped beside the monitors but to read the script and perform the puppet as a character. Students were paired together but each pair was given a different script to perform. The goal of the exercise was to be bold in terms of character choices as the script that Miss Hannaford and her pair named Will was given could be interpreted in many different ways! After all the groups performed their scripts, it was time to rehearse the group song a few more times! 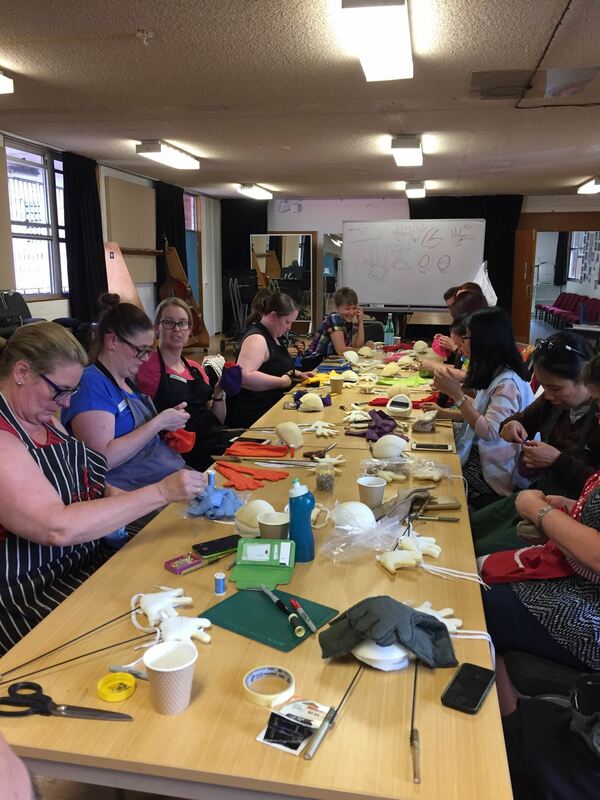 The performance workshop ended at 4pm because everyone had to run back to the build workshop to finish their monkey puppets! All Miss Hannaford had to do was attach the nose and eyes to her puppet. What really interested Miss Hannaford was that the nose shape of her puppet was printed using a 3D printer and that while she was at the performance class, the volunteers in the build workshop had glued on a safety stem from a doll joint so she could attach the nose to the puppet and it won’t come off! 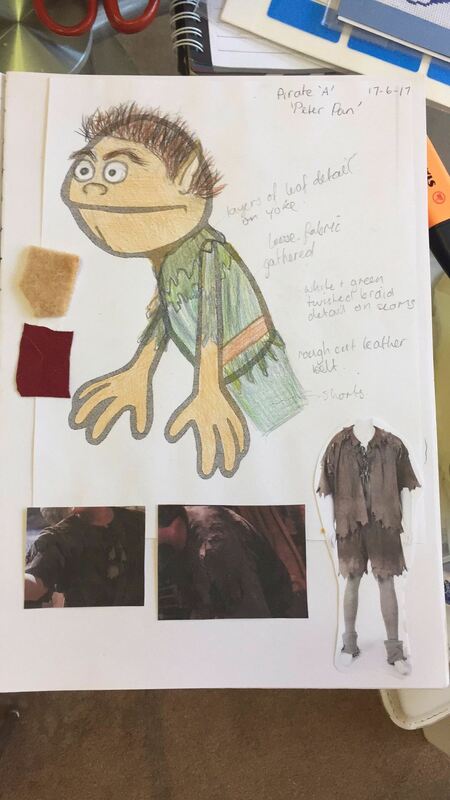 Once the puppet was finished, Miss Hannaford had to take her puppet to a photo shoot back in the theatre and race back to the performance studio so she could rehearse her performance piece and the group song with her new monkey puppet called Matilda! At 7pm, the audience for the show started to arrive. The audience was made up of friends and family of the attendees; Professors, Lecturers and students from the University; and people off the street who had heard that there was a free puppet show! Everyone did their little performances that included songs, scenes and jokes. 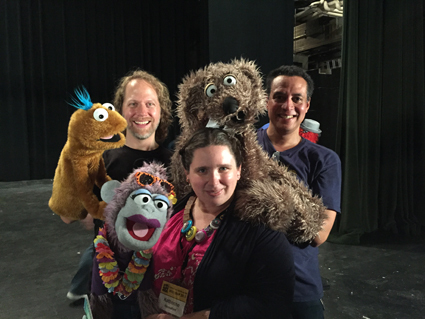 The two performance teachers Noel McNeal and Peter Linz used puppets to act as hosts for the show by introducing each act but they also helped the workshop attendees perform their characters by moving arm rods or bits of scenery! 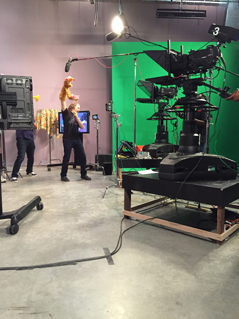 You can see a panorama photo of the TV studio and set we got to perform in at the bottom of all the pictures! You can even see the 2 real tv cameras that recorded the performance! The show was really funny and the group song was a huge success! At the end of the show, it was time to take the big group photo and for everyone to say goodbye. Miss Hannaford’s highlight was to have a picture taken with the teachers Peter and Noel but she also got a hug from both of them! 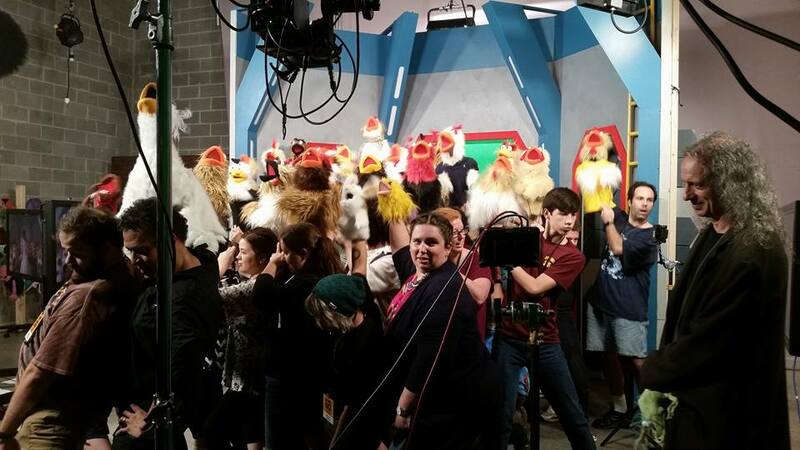 I was really proud of Miss Hannaford for being brave and performing in front of a TV camera and studio audience! Tomorrow we fly home to Australia. I can see how tired Miss Hannaford is after such an exciting week so I expect that she will sleep most of the way home. I had a wonderful holiday with Miss Hannaford! Lucy, Miss Hannaford and Matilda Monkey. Day 4: Wednesday, May 20 2015. Second day of Beyond the Sock! Many of the workshop students including Miss Hannaford are staying in the same hotel so we ended up having breakfast together which gave us a chance to learn each other’s name and where in the world we came from. Miss Hannaford and I are the only humans and puppets from another country. Everyone else lives in the United States of America. The hotel has it’s own little shuttle bus and everyone going to Beyond the Sock caught the bus over to the University of North Texas. The University’s theatre building not only has the workshop rooms we are using but also a huge theatre for performances. Everyone met there before we were split into 2 groups. Miss Hannaford was in group A along with 8 other people. Group B had 10 people in it. The reason we were split into small groups was so everyone could get individual attention and help from the teachers but also to be safe inside the two workrooms since there was lots of machinery and cables around us. Miss Hannaford was given a timetable which showed Group A did Puppet Making in the morning and Performing for TV in afternoon after lunch while group B did the opposite. 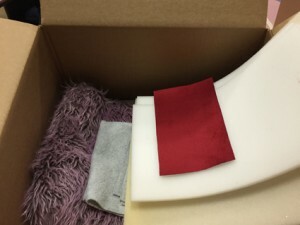 All the students were given their own special box of supplies based on the fur and fleece they chose the day before. 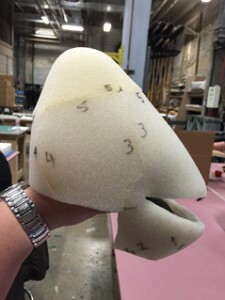 The main task in the puppet making class was to cut out and glue the foam together for the Monkey head as well as trace the hand template onto the fleece fabric so they could be sewn together ready for class the next day. Lunchtime was at 12:45pm so all the students and teachers walked down the short street from the building to a wonderful pizza restaurant called Crooked Crust. This gave Miss Hannaford a chance to talk to students from Group B to find out what they learnt in their morning session. The afternoon session started at 1:45pm promptly. 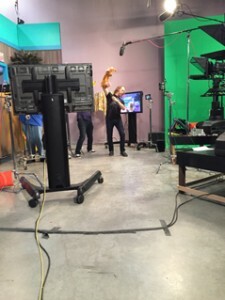 The first exercise was to hold your hand in the air as if there was a puppet on your arm and learn how to move your hand properly so that the puppet eyes were looking directly at the mirror. 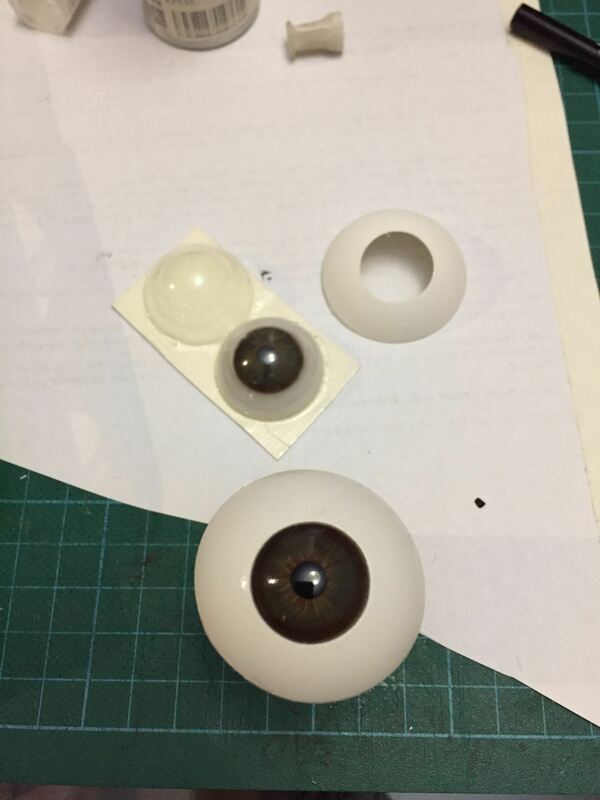 One of the teachers is Noel McNeal and he gave us practice puppet eyes made of paper with a pipe cleaner ring. We did the alphabet as well as counting to 20. 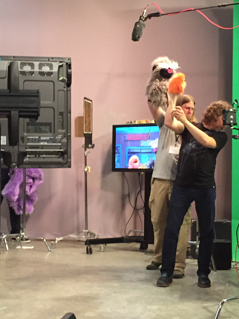 The big challenge of the afternoon was to use actual practice puppets and stand in front of a TV camera so that the puppet is in the view of the camera not the head of the puppeteer! 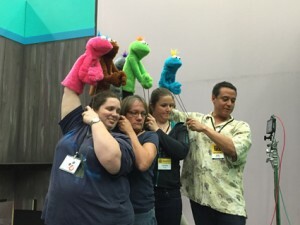 We learnt to centre the puppet and make it look directly into the camera then make the puppet walk into the ‘shot’ say hi and walk out without moving our feet! The workshop day ended at 6pm with a bus ride back to the University. Miss Hannaford did go with some of the other students to a local craft store to buy some costume elements for her puppet and we all had dinner together at one of the restaurants next door to the hotel! 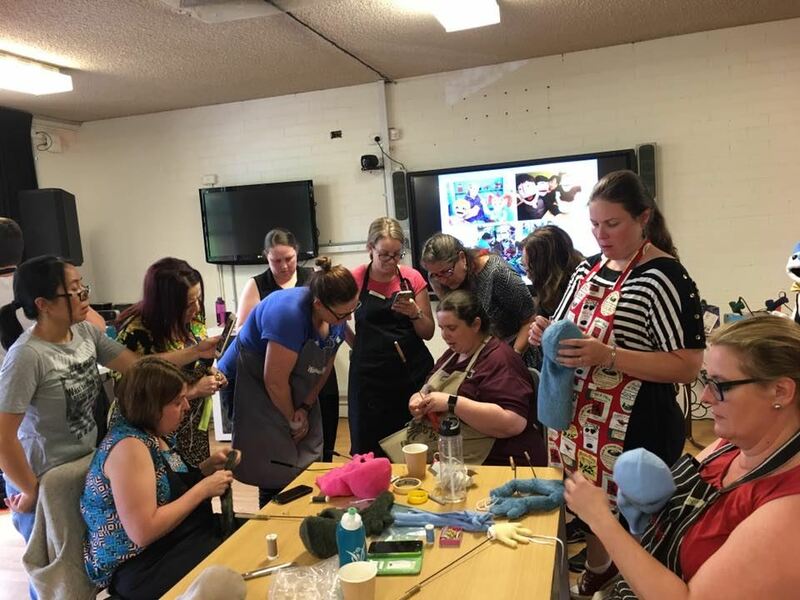 Here is a video made by the staff at Beyond the Sock made about some of the activities we did during the first 2 days of the workshop! Today’s timetable was the same as yesterday. 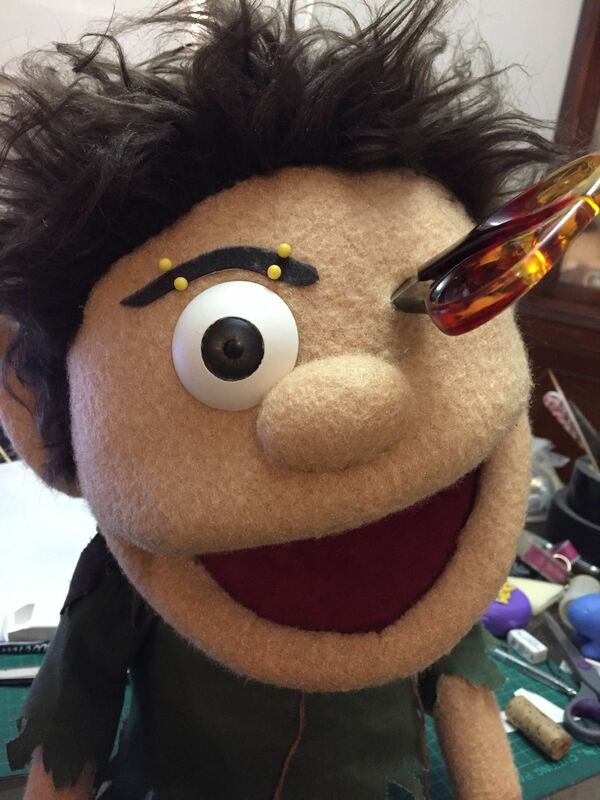 Puppet making in the morning, Puppet performance for film and TV in the afternoon. In the making workshop, Miss Hannaford started to cut out the purple fur of her monkey. Very quickly all the worktables, floor and people’s clothes were covered in the different fur we were all using! Everyone had a different colour of fur and when fur is cut, it becomes really messy! 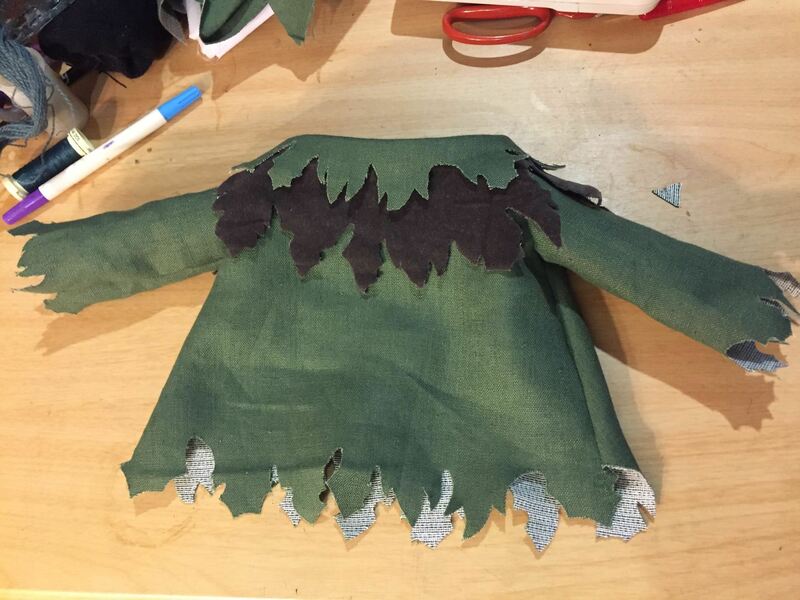 Then it was time to start to sew it together. 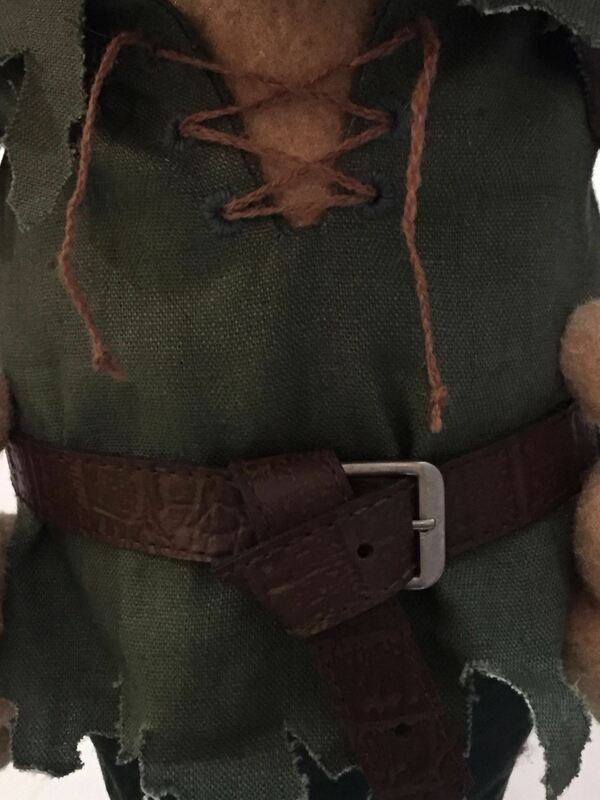 Student’s had the choice of sending the cut out pieces to the expert sewers in another room, but Miss Hannaford wanted to sew the puppet herself so she ended up taking the puppet pieces back to the hotel to sew together for homework. In the afternoon workshop, Miss Hannaford started working with other students in group performances. 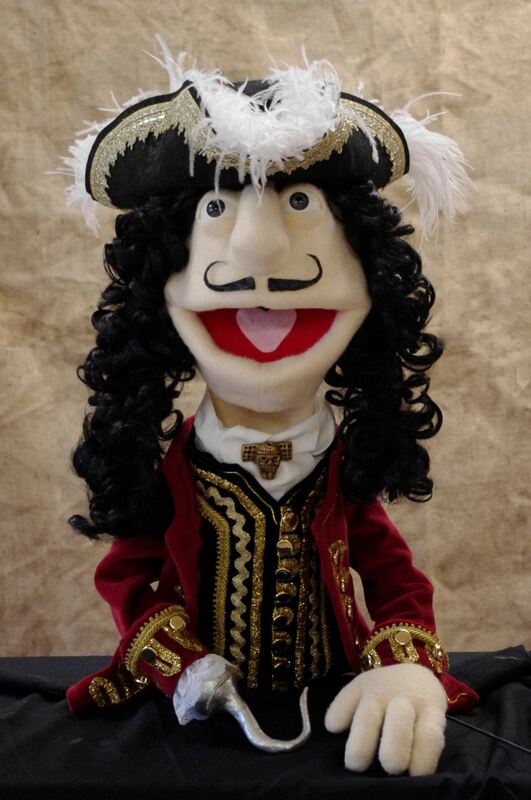 The lesson was to get the puppet to look at each other while another character was talking. 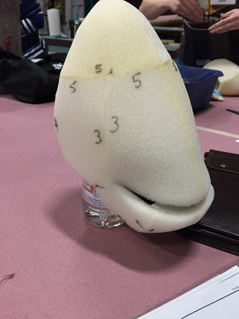 Another exercise was to get the puppet to use it’s head to describe directions. The puppet had to walk into the shot, look at the camera and say “Hi, I was over there and now I am going over here”. 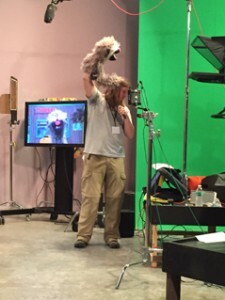 On the word “there” the puppet had to look in that direction, then face the camera again and turn the other direction when saying “here” When performing a character for TV, the puppeteer looks at small tv screens around them to see what the puppet is doing. The challenge is that if the puppet walks right, on screen, the puppet is moving left so it is very tricky to work out which way the puppet is actually going when the puppeteer has to move as well. In the next picture, Miss Hannaford is performing the pink puppet with 2 other students. The man at the end with the blue puppet is famous puppeteer Noel McNeal! You can see one of the tiny TV screens we used while performing next to his shoulder. 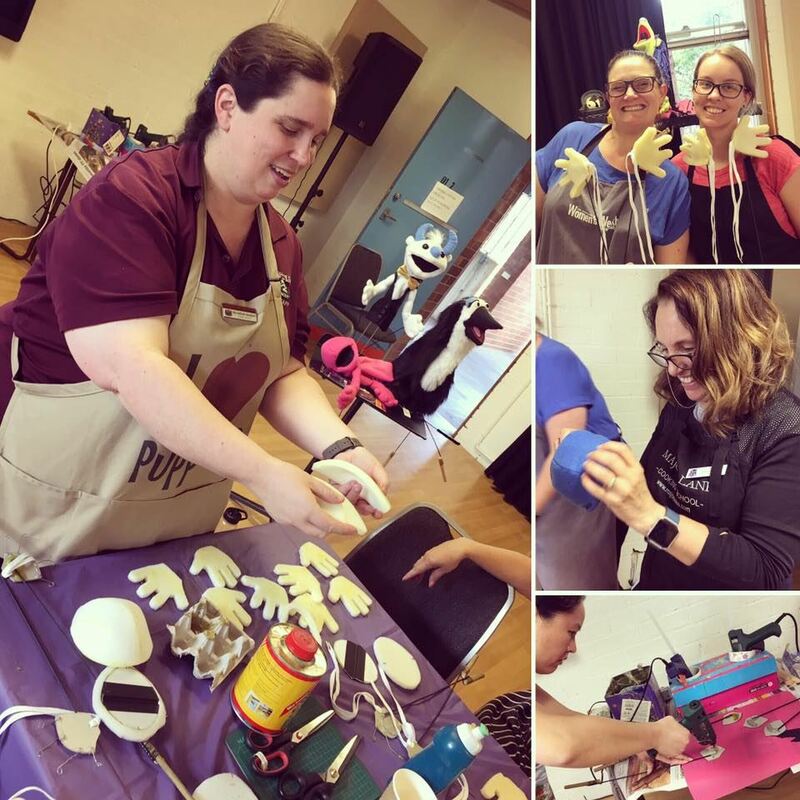 Here is the video of today at the workshop created by the Beyond the Sock Staff! Can’t wait for tommorrow’s excitement! Today was our first full day in Denton Texas. Denton is a small, spread out town 30 minutes away from Dallas which is a big city. Since today was the only day Miss Hannaford has free to explore the town before she attends the puppetry workshop for the rest of the week, I decided to let her choose what places we were going to visit. Miss Hannaford is working on some puppet and robotics projects and she wanted to visit local fabric and hobby stores so we walked down to the local train station, caught the train into the transport interchange, waited for a route 6 bus to take us to a fabric store called Jo-Ann Fabrics. 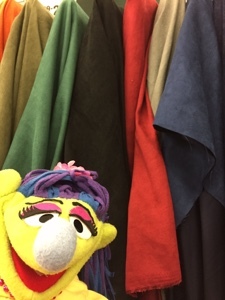 Miss Hannaford was really excited to find some puppet making fabric called micro suede she has always heard about but never actually had the opportunity to see or touch! She asked me to pose in front of the fabric before we took it over to the cutting counter to buy! We caught the route 6 bus back to the interchange and changed to a route 2 bus to go to a local shopping mall- we call them shopping centres. 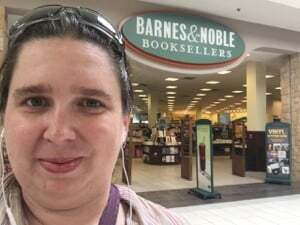 Both of us wanted to visit Barnes and Nobel bookstore as it is larger than any book store we have in Australia. I wanted to check out the DVD section and Miss Hannaford wanted to look at all of the books but especially the comics and graphic novels to get ideas for new books in the school Library. We had lunch at the Mall before walking across the street to a hardware store and a Hobby Lobby store to look for more puppet and robotics materials. We only found one thing on Miss Hannaford’s list but since it was very hot outside, we walked back to the hotel. We had dinner at a real Texan Steak House Restaurant. Texas is famous for it’s cattle farms called Ranches and real cowboys work on those ranches. Miss Hannaford’s workshop starts tomorrow afternoon but she has been told that there is one more hardware store near to the hotel that she can visit in the morning. So we need a good night’s rest before all the fun begins tomorrow! 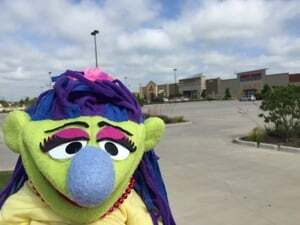 After our 3 month adventure around the world last year, I did not expect Miss Hannaford to take me again on one of her overseas puppet adventures but I am now here in Denton Texas accompanying Miss Hannaford to Beyond the Sock puppetry masterclass. 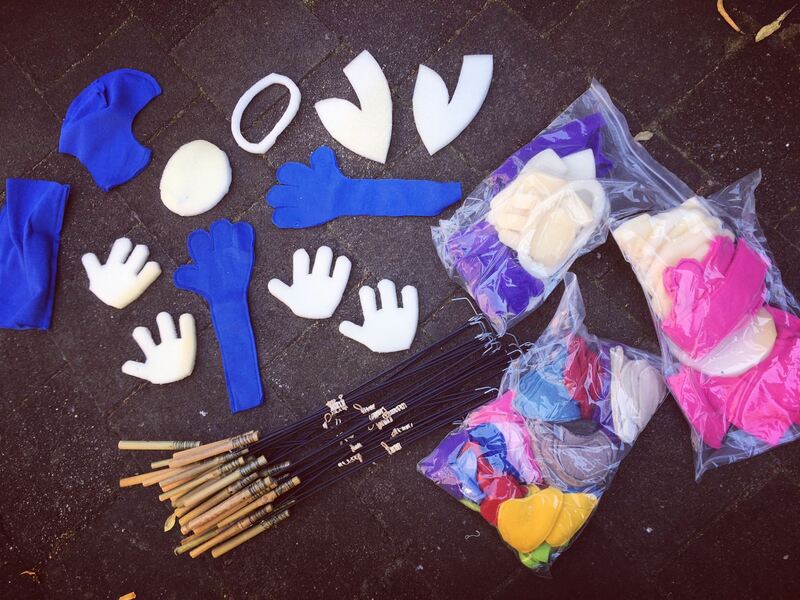 Miss Hannaford is going to learn more about puppet making which she is already very proficient at but she is really looking forward to learning how to perform Muppet style puppets from puppeteers who actually performs Muppet characters. 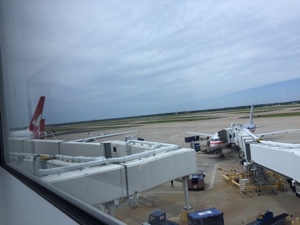 The adventure began with a long 15 hour flight from Sydney to Dallas Fort Worth Texas,USA. Miss Hannaford watched lots of movies and TV shows on the plane but her favourite new movie was Hugo about a boy who lives in the train station in Paris and secretly repairs an automaton- a clockwork puppet! Hugo is based on Miss Hannaford’s favourite book in the school Library- The Invention of Hugo Cabret by Brian Selznick. Here is a trailer about the book and why the author chose to use both text and long sequences of pictures to tell the story. 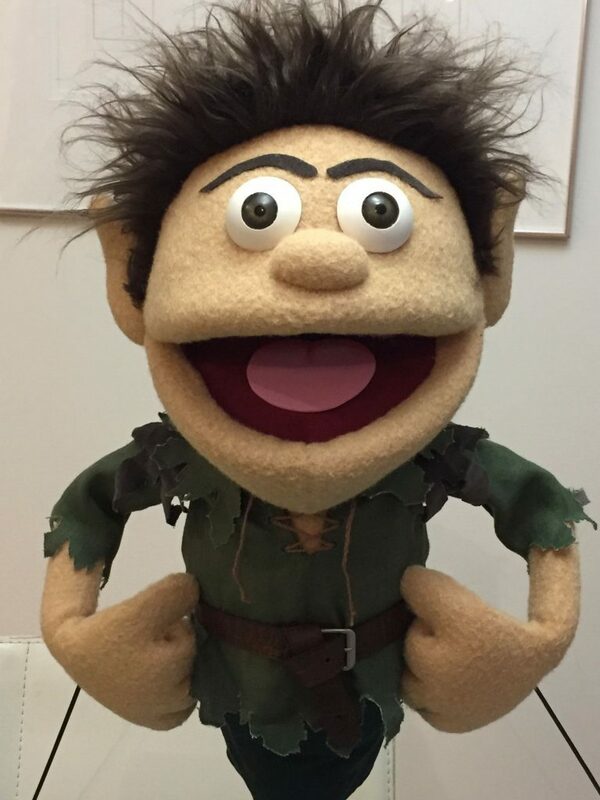 Tomorrow the plan is to visit lots of fabric and hobby stores to find all the puppet making things Miss Hannaford has never been able to find in Australia.